Follow Tang the Ocean Detective on his way to solving today's mystery adventure! Touch the screen to activate different characters and read to your child anywhere, anytime right from your own iPad. 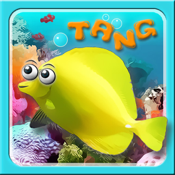 Tang the Ocean Detective is an engaging story that focuses on collaboration and teamwork, which is influential in boosting cooperative behaviors in children. All Mystic Tales are co-written with an elementary school teacher and are focused on positive themes; delivering a great message while entertaining your child on a fun and delightful journey of growth and creativity. ☆Fun, touch-active characters come to life on every page..
☆Beautiful, color illustration with an adventurous story..
☆Features 90°Turn technology which allows for a creative solution to page turning. Turn the iPad 90° clockwise to advance to the next page! ☆A fun and unique way for your child to interact with your iPad!